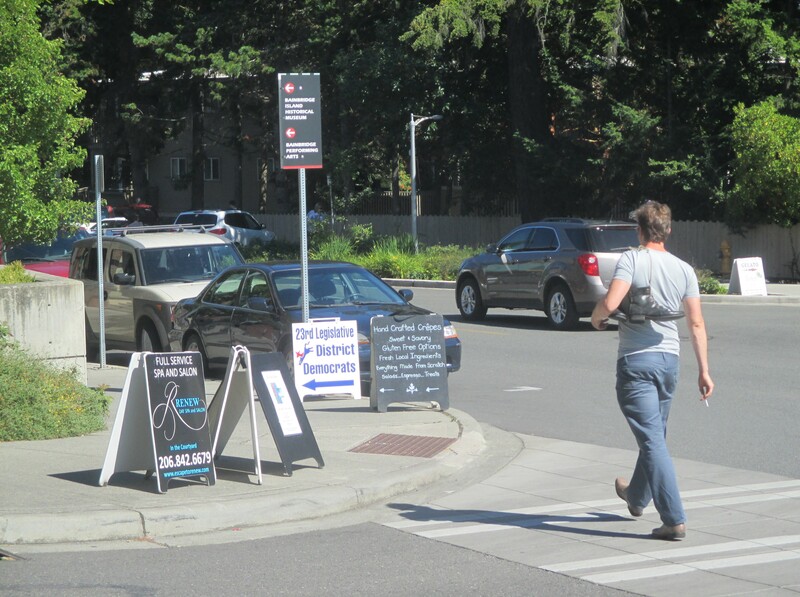 A pedestrian crosses Ericksen Avenue as he walks along Winslow Way next to a number of business sandwich boards. 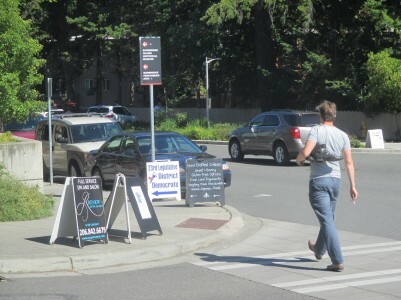 Even though last month the Bainbridge City Council pleased Winslow Way merchants with the process it and the city took in updating an ordinance for the retail use of sidewalks for cafes and displays, the City Council is still keeping a close eye on the seemingly growing use of sandwich boards by island businesses. At the July 21 meeting, council member Steve Bonkowski wanted to add an item under council discussion about sandwich boards since a number of people had made comments about the influx of sandwich boards and trees advertising a hospital on public land. Bonkowski said he would refrain from talking about the use of the trees for another time and would focus the discussion on sandwich boards. Bonkowski said it appeared there were two different varieties of sandwich boards: ones that advertise to consumers to “come on in” and others that direct the locations of businesses. City Manager Doug Schulze said that on July 21 that the city’s Code Compliance officer found 39 signs from Madison Avenue, along Winslow Way, to State Route 305 with two violations. On July 18, the Code Compliance officer found 43 signs and only two violations for multiple signs that were off-site. Schulze said he’s aware businesses use sandwich boards also on High School Road. During the recent economic downturn, Schulze said cities often gave businesses more latitude on sandwich boards for advertising. Schulze also used a PowerPoint presentation to show the City Council some examples of how cities, including Seattle, use uniform directional signs to direct people to businesses. Bonkowski then asked Schulze whether something could be done this summer to impact the issue. Council member Wayne Roth noted there are city directories in the Bainbridge ferry terminal and Columbia Bank that are updated, already in place and providing solutions to the situation. Roth said he’s used them many times with tourists who needed help finding food and clothing locations. Schulze said he planned to have a discussion with the business community about sandwich boards in the near future and revisit the issue with the City Council possibly as early as September. Any change in the city’s sign ordinance would require public hearings. Here’s editorial cartoonist Milt Priggee‘s take on City Manager Brenda Bauer’s sudden firing this week. Update: Click here for my expanded coverage of the meeting. In a surprise move, the City Council decided to immediately fire City Manager Brenda Bauer, sending her home in the middle of Wednesday night’s council meeting. Deputy City Manager Morgan Smith was appointed acting city manager. The council estimates it may take six months before a new city manager is hired. The city had decided in late January to terminate Bauer’s contract, but had planned to keep her on for a few months while the council looked for her replacement. Bauer’s sudden exit means she’ll get a bigger payout from the city. Her severance package had included $75,000 plus six months worth of benefits. Having her leave before the 90-day transition period ends means she’ll get an additional $37,500. “The council felt this was in the best interest of the city,” Councilman David Ward said when asked about the decision to have Bauer leave early. He and other council members declined to say anything more specific. Ward made the motion for Bauer’s immediate firing. Council members Sarah Blossom, Debbi Lester and Steve Bonkowski supported the motion. Council members Anne Blair, Kirsten Hytopoulos and Bob Scales voted against. A scuffle broke out in the council chamber shortly after the vote was taken. Former city council candidate Robert Dashiell exchanged angry words with former councilman Bill Knobloch over Bauer’s firing. Dashiell said Knobloch pushed his chin with a finger and that he responded with a shove. Knobloch said Dashiell did more than shove him, but would not say more. Police were called but no arrests were made. Poll: What do you think of the city manager’s departure? Some say she saved the city. Others say she did more harm than good. Brenda Bauer’s 18-month tenure as city manager has been quite eventful. She led the city though a serious budget crisis, an employee restructuring, the Winslow Way reconstruction project, controversies involving the police force, the Civil Service Commission drama and several other headline-grabbing matters. Now the City Council has decided to part ways with Bauer, preferring to find new leadership for a mostly new council. What do you think of the decision? Do you think the council should have kept her on, or was it time for her to go? Head over to the poll in the right column to cast your vote. As for our last poll about how to spend the $2 million Washington State Ferries settlement, it looks like the Waterfront Park dock improvement idea won out – but just barely. Last night, the City Council voted to end Brenda Bauer’s short tenure as city manager. It was an emotional meeting, with one council member leaving in protest after he was cut off from discussing the recruitment process for the next manager. The city issued a press release this morning. You can read it below. -The city has a new manager…at least for now. Here’s my story. -Did you hear what the Sun said about the city of Bainbridge? I won’t say the Sun called the city “stupid” but it was sure close. Read the Sun’s take on the city’s policy of charging its road ends committee permit fees here. -Bainbridge’s mywedding.com and Rep. Jay Inslee weighed in on the net neutrality issue. -The island’s largest farm is leaving. American Gold Seafoods, which operates the salmon net pens near Fort Ward, is packing up and moving across the water to Manchester. Read about the move here. -Speaking of farms, it looks like local growers are getting a boost from three (yes, three) new Winslow restaurants that specialize in local foods. They are Hitchcock (which we’ve discussed here before), Arbutus (in Mon Elisa’s old spot) and Local Harvest, which is set to open at Penelope’s former location by July. Look for my story in Monday’s paper. -Also next week, look for my stories about City Hall’s effort to grow food for the grazing masses and the new teen sensation: Parkour. The new City Manager (and old City Administrator) Mark Dombroski gave a detailed assessment of the city’s financial challenges at a Bainbridge Island Chamber of Commerce luncheon on Wednesday. You can read my coverage of Dombroski’s talk here. My story focuses on Dombroski’s assessment of the city’s limited revenue base and how greater economic diversity – particularly through a tourism industry boost – may put the city on more stable financial footing. 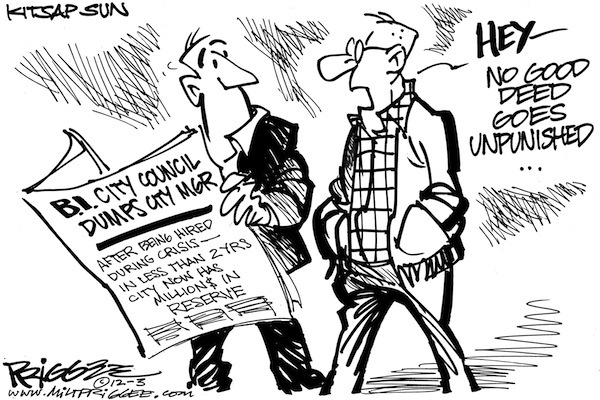 The limited revenue base (which relies heavily on growth and development) was only one problem the city faced as it entered the the recession. 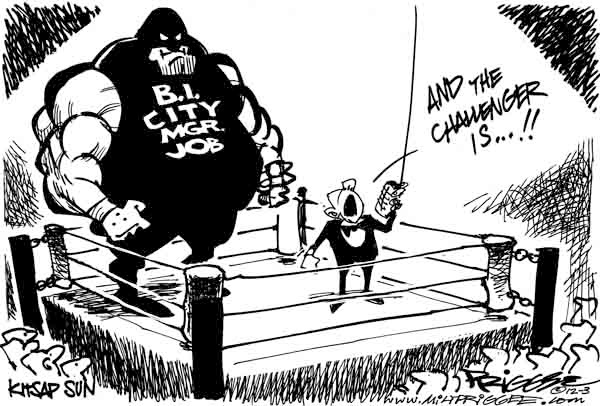 According to Dombroski, the city had in recent years grown beyond the reach of its relatively volatile revenue sources, had increased its staffing levels, taken on a greater role in providing community services since 2000. He said the city’s geography is particular challenge. Bainbridge is the state’s eighth largest city in terms of land size but ranks 40th in populationf. That makes for a thinly populated city. Bainbridge’s density, according to Dombroski, is ranked 223 out of 281 Washington cities. The city has 32 square miles for police to patrol (vs. 23 sq. miles for Bremerton), 53 miles of shoreline to protect and 132 miles of roads to maintain. The small population generates low levels of revenue in proportion to the size of the area under the city’s care. While it quickly became apparent on election night that voters don’t want a mayor in City Hall, it’ll likely take a week before the head office is passed to the new city manager. According to City Attorney Paul McMurray, the transition to a council-manager government takes affect on June 3, when Tuesday’s election is certified by the Kitsap County Auditor. Mayor Darlene Kordonowy, at that point, has the option of becoming a eighth City Council member until her mayoral term ends in January. The council would then revert to seven members. Kordonowy is open to a seven-month council term. “If there’s going to be a change, I want to continue to be apart of (the new government), and I’d be willing to serve,” she said on Tuesday, shortly after early election results showed the council-manager measure was passing by a wide margin. 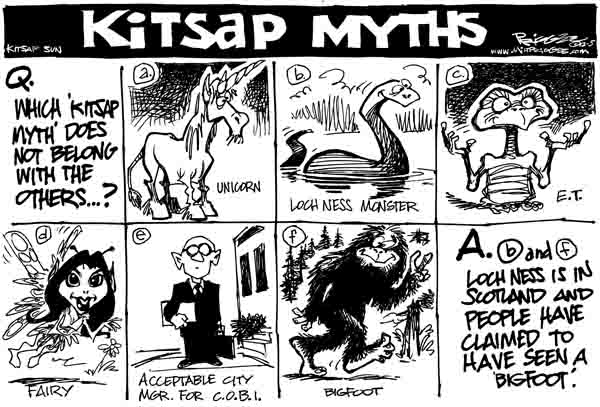 The Kitsap Sun Editorial board hosted a discussion about the May 19 vote to change from a mayor-council form of government to council-manager. Dennis Vogt, an Island resident who led the effort to get the question on the ballot, spoke on behalf of the manager form. David Harrison, an Island resident and government policy scholar, spoke to the existing form. We apologize for the low audio quality in the beginning of the video. The sound increases about 11 minutes in. the conversation also becomes more lively towards the end. The City Council set May 19 as the date for a special election that will decide whether Bainbridge will retain an elected mayor as its leader or opt for a manager hired by the City Council. The state recently altered elections rules to allow change-of-government votes on months other than November. Petitioners had collected over 1,000 signatures from Bainbridge voters to earn the measure’s place on a ballot. The council on Wednesday also approved up to $75,000 to pay for the special election. The cost will likely be split with the Bainbridge School District, which is seeking approval of a capital bond also on May 19th. If approved, Mayor Darlene Kordonowy would become an eighth city councilor until her mayoral term expires at the end of the year. City Administrator Mark Dombroski would then take the city’s helm as the new city manager. Former city councilman Bob Scales is the only candidate currently running for mayor. Kordonowy said today that she remains undecided about seeking reelection. She will make her decision before the May election, she said.